ELEXWooCommerce Bulk Edit Products, Prices & Attributes ( Previously known as XAdapter’s Bulk Edit Products ), makes it very easy to bulk edit WooCommerce product fields such as SKU, Catalog Visibility, Stock, Quantity, Regular Price, Sale Price, Shipping Class, Weight, Dimensions, Attributes & Any Product Meta Fields. You will even be able to undo the last bulk edit operation either completely or Partially. The plugin allows you to mass bulk edit 10000s of products at a time whether it’s Variable or Simple Product. You can filter the products to edit using the Filter option provided by the plugin. Filters can be applied using various parameters like Type of the Product, Category of the Product, Attributes, Price, etc. A wide range of Filtering can be set using RegEx patterns and also, exclusions can be configured. 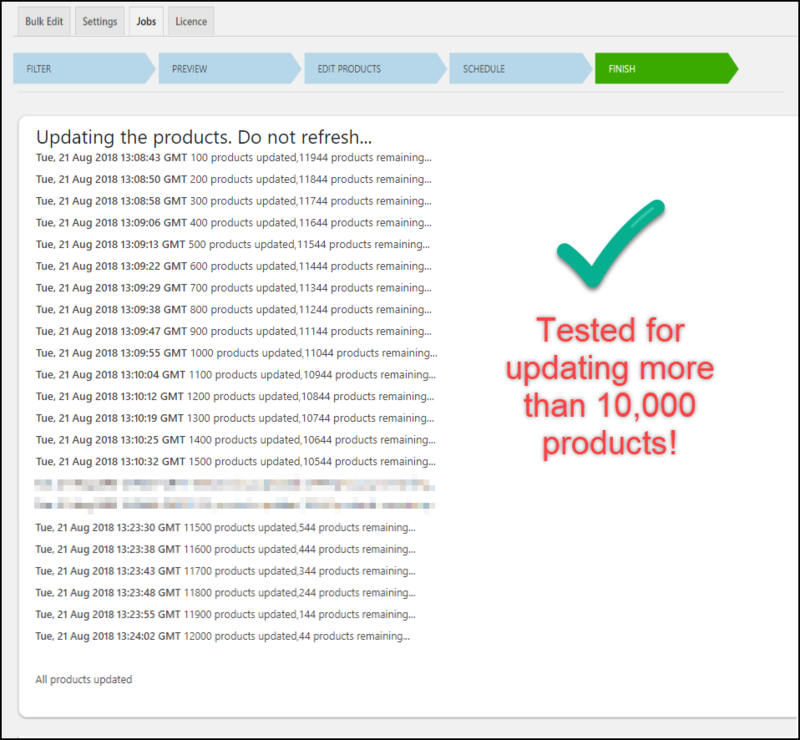 If you have many products in your store, with variations, this plugin is really useful to keep your store updated or modify various attributes of the products in a few clicks. It’s the fastest way to switch the store to a new WooCommerce store with updated pricing and attributes. Update regular or sale price of all variations products within one selected product category. Bulk Add/Update Sales Price based on the Regular Price. Increase or decrease all prices in a category by a set percentage (%) or dollar($) value. Bulk add sale prices to products that do not currently have sale prices active. Update SKU and Stock of all simple products that have a particular price. During the sale, the period changes the Sale Price of your products in a particular category. Update Attributes/Prices for those products starts/ends/contains a specific string in the title Or matches a specific regular expression (RegEx). Bulk update Dimensions for all products except for a particular Category of Products (configured using Exclusion list). Filtering is possible based on various conditions (Eg: Title Starts With | Ends With | Contains Text | Regex Match, Price Greater Than | Less Than | Equal To | Between, Etc.). Further, if you wish to exclude certain products from the filtered products, you can do this using Product IDs and Product Categories. Since the bulk editing process affects multiple products, it is importannt to move through each step, carefully. Are the filtered products exactly the ones that you require for bulk editing? If yes, you can move ahead with the bulk editing process. Else, you can simply go back and apply new filters. Filtered Simple and Variable Products. Ajax Search on Previewed Products. You can bulk edit one or multiple product properties at once. 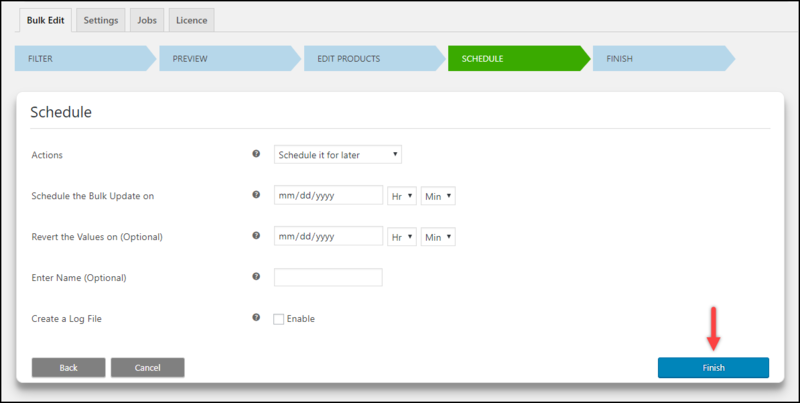 With this, you can save time for updating multiple product properties. 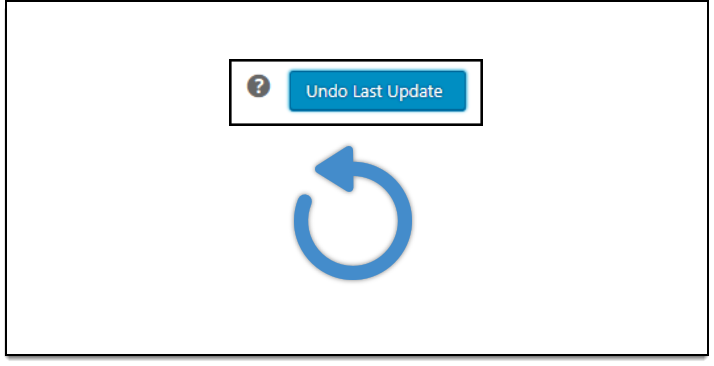 If you wish to perform the bulk update operation at a scheduled date & time, the plugin offers some handy settings to do this. You can also revert back the update at a specified scheduled time. You can now make use of Regular expression (regex) patterns for filtering as well as bulk editing product title & SKU. The plugin accepts the general regex pattern syntax.For example, if you want to replace product titles of all the products starting with 'Woo', enter the pattern in square brackets as '[^Woo]' without the single quotes. With the latest update, the plugin now allows you to add a new or an existing attribute & its values to the filtered products. You can even use the configured attributes for variation purpose. It also allows you to remove or replace an existing attribute from the filtered products. All this in just a few simple clicks! 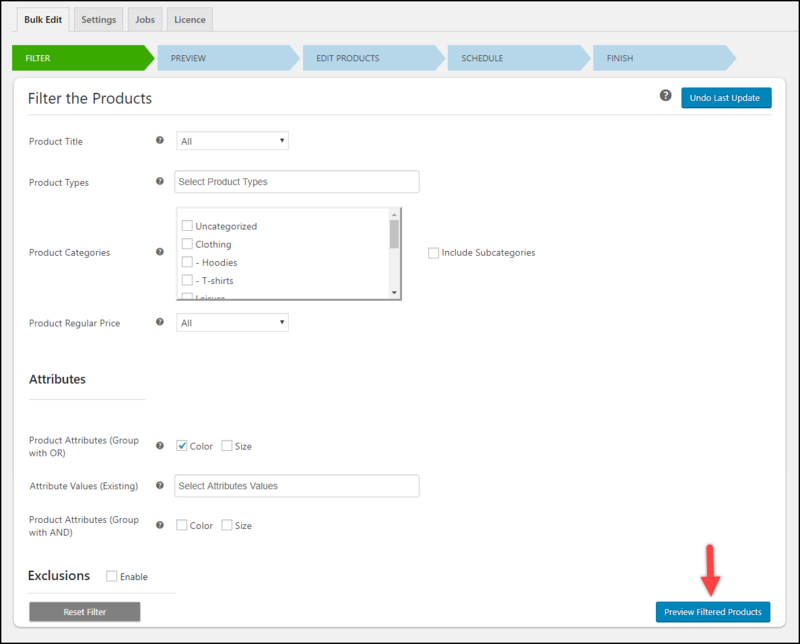 Just like Product Attributes, you can choose to add, remove, or overwrite existing Product Categories to the filtered products. If you have installed a third-party plugin and would like to update product fields of that plugin, you can simply enter meta keys of the required product meta-fields in the Custom meta settings. For example, to update Tariff code for ELEX Australia Post plugin in bulk, you can enter the meta key '_wf_tariff_code' in the given settings. This meta-field will then be available in the product properties during the bulk edit process. Completely Undo the last bulk operation. Partially Undo the last bulk operation. Undo operation will be allowed before the session expired. The plugin has been tested to bulk update more than 10,000 products precisely. This makes our plugin the most feasible WooCommerce plugin for bulk editing products. I am so happy! This adapt the plugin for my needs, and finaly, it works fine and give me a really help for my website! This is a precious time! Thanks a lot! Can I bulk edit fields from other plugins data? Definitely. If you have the meta key of the field you want to edit you can do so. 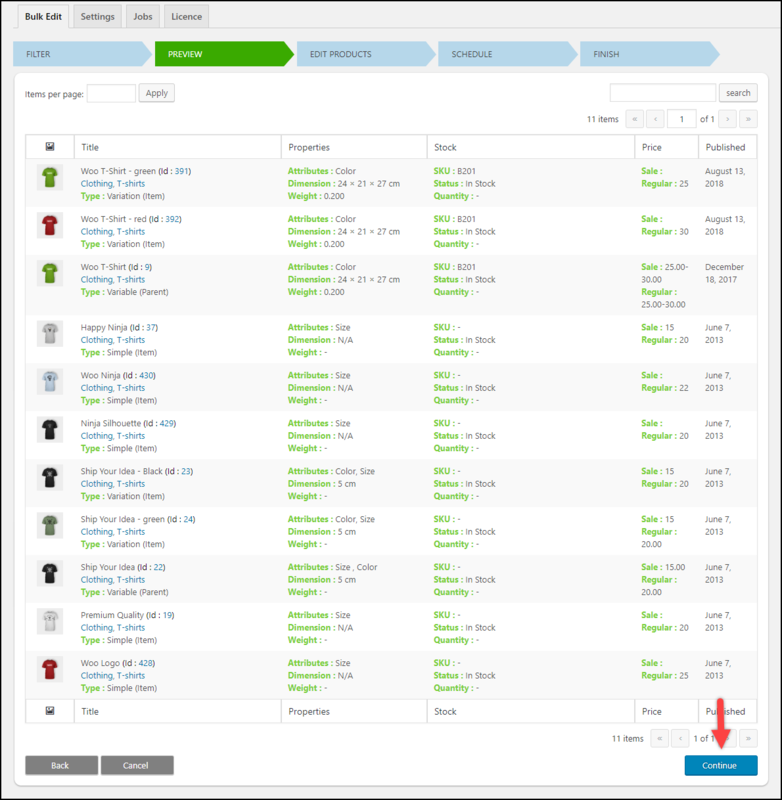 You can follow the instruction in our article on How to bulk edit/update Product meta-fields?. The article includes a video tutorial of the process as well. How to filter products for specific items? You can filter the products based on category, subcategory, and also by attributes. We do have other options to filter by product price, product type and more. Is this plugin compatible with lower versions of WooCommerce? We support WooCommerce version 3.0 and above. There might be issues if are using an earlier version of WooCommerce. I have a shipping plugin that requires weight and dimension. Can I update my products with this plugin? 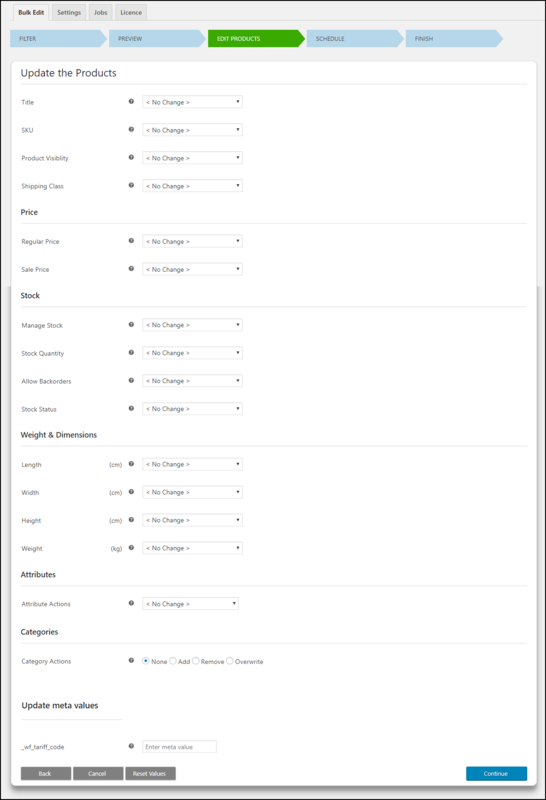 Yes, you can filter products by attributes and other filter options. You can edit or add weight and dimension to the products. Can I exclude products from editing? Yes, you can enter the product IDs you want to exclude while filtering and process the updates only for the ones that are filtered. Can I add a new attribute to the filtered products using this plugin? You cannot add a new WooCommerce Attribute using the plugin. But you can add an existing WooCommerce attribute to the filtered products, add new/existing attribute values and also choose to use that attribute(s) for variations. Can we change the stock amount or edit them? Yes, you can filter the products and add stock, change the stock status or even allow backorders. Excellent bulk editing tools and the devs worked hard for over a month to solve the initial issues we had with the script! Does exactly what I want it to do. With hundreds of products which have different prices for different sizes, this plugin is exactly what I’ve been looking for. I loved this plugin so much, that I had to buy it again for my 2nd store that I’m working on. There was an issue with the API key not activating, due to what ended up being a coding problem. Support responded and fixed the issue quickly. Great plugin that makes it extremely easy to edit all prices at once, and works pretty quickly too. Highly recommend this plugin. We would recommend this plugin to anyone needing to do bulk editing of variable products in Woocommerce. (By March 2017) we had researched literally every bulk edit plugin out there and cocluded XAdapter´s Bulk Edit for Woocommerce is the best plugin on the market for doing bulk price changes, sale price changes, and bulk editing of many other product features. The interface is very clear and easy to use for our clients and even offers a rollback function. The support team´s follow-ups have been nothing but quick and reliable. The team even took our suggestions to implement a round function in order to get aesthetic prices after bulk price changes.